Wahoo is a widely distributed fish, found in most tropical and subtropical regions. They are fished incidentally throughout their range, primarily by fisheries targeting mahi mahi, swordfish, and tuna. Landings have increased in the past 50 years. Wahoo have life history characteristics that give them medium resilience against fishing pressure. Very little is known about the wahoo stocks in both the Atlantic and Pacific Oceans. More data is needed in on population status. Wahoo are managed by the South Atlantic Fishery Management Council (SAFMC). Regulations exist concerning size and catch limits. Enforcement by wildlife and fisheries agencies, the US Coast Guard, and NOAA is effective. Improvements could be made regarding stock assessments. In the Atlantic handline and troll fishery, yellowfin tuna and swordfish are caught incidentally. It is thought that the yellowfin is close to being overfished. Mahi mahi, yellowfin and bigeye tuna are the main species caught in the Hawaiian troll fishery; the unknown stock status of mahi mahi is concerning, and bigeye is likely being overfished. Trolls and handlines do not come into contact with the seafloor, and therefore have minimal habitat impacts. Wahoo is a widely distributed fish, found in most tropical and subtropical regions. Wahoo catches have been variable over time and are caught as bycatch in the tuna fishery. Peak catches occurred in the mid 1990’s around 3000mt and in 2013, 2,346mt were caught. The landings of wahoo in the eastern Pacific Ocean are unknown as they are combined with other unidentified tuna and tuna-like species. Wahoo have life history characteristics that give them moderate resilience against fishing pressure. No stock assessments are performed for wahoo in the eastern Pacific Ocean and they are caught as a bycatch species. It is thought that their population is healthy. Wahoo have not been fully assessed in the North or South Atlantic but it is thought that their population is stable, and fishing has not decreased their abundance. Wahoo in the Eastern Pacific Ocean are managed by the Inter-American Tropical Tuna Commission. No management measures are in place for wahoo in this region. Management is lacking in regards to the regulations around bycatch levels. Wahoo in the North and South Atlantic are managed by the International Commission for the Conservation of Atlantic Tunas (ICCAT). FAD purse seines catch a large number of bycatch since they are a non-selective fishing method. Several species of threatened status are caught, as the oceanic whitetip shark and the silky shark are particular concerns. FAD purse seines typically do not make contact with the seafloor unless the FAD is anchored to the bottom; however, the fishery captures exceptional species (i.e. species whose importance to the ecosystem is disproportionately large). Wahoo in the US Atlantic and Gulf of Mexico is caught as part of a fishery targeting tuna, swordfish, blue shark, shortfin mako shark, and mahi mahi. 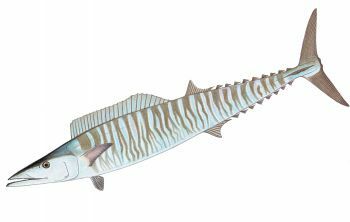 The population status of wahoo is unknown but is not thought to be of concern as the IUCN lists wahoo as being “Least Concern” and the species is moderately vulnerable to fishing pressure. The National Marine Fisheries Service and the South Atlantic Fishery Management manage the wahoo population. Pelagic longlines are unselective fishing methods and catch a large number of bycatch species. Bycatch species of concern include bigeye tuna, short-finned pilot whale, silky shark, and Atlantic Bluefin tuna. Habitat damage is negligible as longlines do not touch the ocean floor. In 2010, 300mt of wahoo were caught in the US. About 22% of the US wahoo is landed by longline.